It can add just the right splash of color to a patio. It can make a small urban terrace seem larger. It invites guests to linger in an outdoor seating area. Often made of a sturdy synthetic, this “it” is an outdoor-indoor rug. In just the past few years, using rugs outdoors has become extremely popular, fueled by consumers’ desire to make their outdoor spaces feel and function like interior rooms, notes Craig Jenkins-Sutton, president of Topiarius, a Chicago urban landscape design firm. These seemingly magic carpets might enhance your outdoor spaces, but there are factors to consider about when and where they belong. Lying out in the open? The label may proclaim a rug suitable for the outdoors, but placement is “preferably in an area where they are protected from the elements,” like a covered porch, notes Los Angeles interior designer Mark Cutler. ‘If you are using the rug fully exposed, then you will want to use a thinner one so it doesn’t retain the moisture [after a heavy rain],” he adds. Polypropylene is a common fabric that allowing outdoor rugs to resist mildew, mold and fading from sun exposure. A quick drying rug is also handy for cleaning, since they can be easily hosed off, explains Kurt Mull of Webster Carpet and Rugs, Cherry Hill, N.J. Anyone who shopped for an outdoor rug a few years ago, but couldn’t find the design they wanted will be surprised at the choices now. At the online home furnishing retailer Bellacor, for instance, the site features three times as many outdoor rugs this spring than last year, with similar annual increases since 2014, says spokesperson Marlon Heimerl. Still, “the rug should compliment the style of the client and should flow with the exterior design,” says Sara Chiarilli, owner of Tampa, Fla interior design firm, Artful Conceptions. 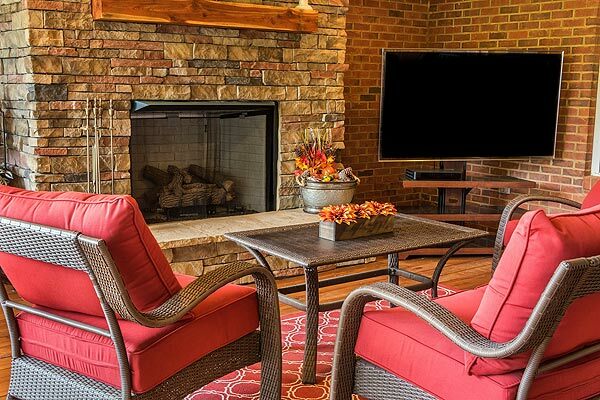 If outdoor furniture is a solid color, choose a colorful, patterned rug, but “busy” furniture or cushions demand a “calming” rug, Chiarilli says. The great outdoors, even when it’s just a step out onto a patio, “can feel limitless,” notes Chiarilli. “A well-sized outdoor rug can help define an exterior room and transform a patio into a space that feels and operates like an interior room,” explains Cutler. “Outdoor furniture has a habit of just floating around on these big decks, but using an outdoor rug correctly will break down the scale and make a giant area feel like a series of distinct spaces,” he adds. Also, when used under a dining table, a rug should be large enough that chairs can be pulled out and in without touching onto the flooring underneath the rug. Maybe because they’re associated with enjoyable outdoor activities like barbeques, informal gatherings and lounging, designers say indoor-outdoor rugs have a fun appeal, and they can be used to brighten just about any space that demands durable flooring. Mudrooms, kids’ rooms, laundry areas and doorway mats are popular insider uses. Moreover, because many indoor-outdoor rugs are relatively inexpensive, consumers can “experiment” with colors and patterns, without a long-term commitment to a particular choice, explains Christine Villanueva of LuxeDecor.